Engagement Ring Brands of the Rich and Famous. Luxury bridal jewelry is dominated by certain brands, and those names attract the most wealthy and celebrated people in the world. Find out which engagement ring brands rate the highest! During red carpet events, a female celeb is always willing to mention the designer who made her gown. But she’s not so quick to share information about her engagement ring. Maybe it’s a privacy thing or even a superstitious belief. Unless you’re a part of celebrity inner circles, you’re not likely to hear a shout-out for their engagement ring brands. The best way to know the engagement ring brands of the rich and famous is to look at their brand loyalty. What designers do they like most for earrings, necklaces, and bracelets? You could scroll through photo galleries and see luxury jewelry flaunted on the red carpet, magazine covers, music videos and lifestyle shoots. When it comes to non-bridal jewelry, these famous ladies are not shy about it! 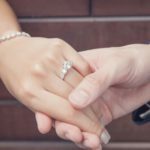 There is an abundance of proof that celebrities and fashion icons love three jewelry brands, in particular: Hearts On Fire, Forevermark, and Simon G. If you want to follow in the star-studded footsteps of iconic brides, you should start by looking at these engagement ring brands! The Hearts On Fire brand claims to offer the “The World’s Most Perfectly Cut Diamond®” and so far, no one has been able to upstage them! Diamond cutters utilize technology and a proprietary cutting formula, using advanced imaging software. This elite brand is frequently seen on the Red Carpet, and their engagement rings have quickly become a favorite among affluent brides and well-known celebrities. Hearts On Fire diamonds are far superior to most of the world’s diamonds. This is what makes these diamonds so appealing. The speciality of the HOF diamond is evident in the brilliance and sparkle, and the A-list ladies have noticed. Forevermark by De Beers is a globally recognized engagement ring brand. De Beers has been prominent on the diamond scene for 125 years. Forevermark is in the upper echelon of luxury jewelry brands- well respected for their superior quality diamond engagement rings. Beginning in 1888, they invested in ownership and control of recently discovered diamond mines. It was De Beers that coined the phrase “a diamond is forever,” which further propelled the demand for diamond engagement rings. Leading ladies such as Laverne Cox, Emily Blunt, Emilia Clark, Charlotte Le Bon, Margot Robbie, Martha Hunt and many others have recently been spotted wearing Forevermark diamond jewelry in the spotlight. Another thing that makes Forevermark the preferred brand for socially conscious celebs and activists is the way these diamonds are sourced. Diamonds strictly sourced from mines that abide by the Kimberly Process, to prevent the abuse of the diamond trade and avoid the financing wars and the like. Third-party auditors are hired to confirm that each Forevermark diamond is conflict-free. 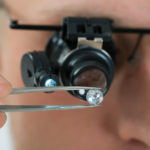 To validate responsible sourcing, each diamond is engraved with an identifying number, only visible under a magnifying glass. Environmental responsibility is a priority for the Forevermark engagement ring brand. For every acre mined, the De Beer Group donates five acres to build natural environments for native plants and animals. The conservation areas, called The Diamond Routes, total over 450,000 acres that are reserved and actively accommodating 1700 animals. There is a special story behind the Simon G. engagement ring brand. Chief designer Simon Ghanimian is a perfect example of what it looks like to live out the American Dream. He immigrated to the United States, and when he couldn’t afford to go to college, he took a job in the diamond industry and worked his way up. Simon became a skilled jeweler and used his natural creativity to design an extraordinary line of jewelry named Simon G. He believes in the power of hard work and a grateful heart, and his company is modeled after these same ideals. Simon G. engagement rings and bridal sets are specifically made “to reflect the brilliance of the woman who will wear it,” and many rich and famous women in Hollywood and New York flaunt Simon G. jewelry on a regular basis. Prepare to be impressed by the endless variety and the intricacy of the settings! Designer Simon G. enjoys tremendous success with his intricate engagement ring settings. His excitement is renewed each time he approaches sketching a new design. The design is subjected to ten quality control stations to ensure the highest level of craftsmanship in the metals and the intricate filigree, engraving and stonework. Instead of glue, Simon G. settings have a minimum of 4 prongs to secure diamonds. Only top quality conflict-free diamonds are used in Simon G. engagement rings. They only accept diamonds that are GH or higher in color, and SI or higher in clarity. Exquisite Marquis by Simon G.
Classic Openwork by Simon G.
Choose a wedding band for the groom that he will treasure for life. The Simon G. men’s collection offers fascinating wedding bands in white gold, yellow gold, platinum, or mixed metals. Men can have diamonds on their ring too, or opt for an interesting two-tone design. Modern Design by Simon G.
If you have very nice taste and you want an engagement ring that outshines the rest, choose from the engagement ring brands preferred by the rich and famous! It’s not your lifestyle or your bank account that matters. What matters most is that you love your engagement ring and that it’s a true reflection of you as a couple, and the love that you share. Cheers! I don’t think any normal person would be able to afford the engagement rings that celebrities buy.